I am so excited to dive into the '18-'19 school year starting next week. And one way we'll make it fun heading into the fall is with a practice challenge. 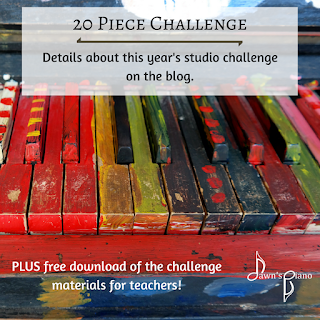 Last year was my first year trying out a studio-wide practice challenge, and I loved the energy and motivation that it brought to my piano students throughout the year. Even my most reluctant practicers had spurts where they were goal-driven and focused on working pieces to completion. So I'm doing it again this year! 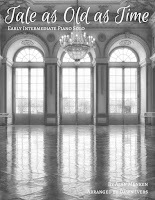 Learn 20 pieces by the end of the term on April 26th. And that's it. Now I know the first question my students will ask when I introduce this to them is "what do I get if I do it?" One of my favorite times of year in the studio is when we get to dig into composing. 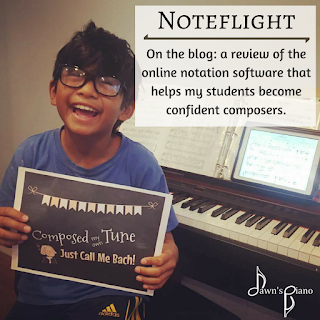 The Young Composers Project has been a highlight the past 4 summers (this year it will be featured in the Spring semester), and in addition to composing & recording their pieces, students have had great success learning to do professional looking notation using noteflight.com. Now I know that there are some more comprehensive music notation software programs available, but let me tell you why I've chosen Noteflight for student compositions. One of my favorite songs as a child was "Tale as Old as Time" from Disney's Beauty & the Beast. I'm going to date myself here, but this was the first movie I saw in theaters when I was 4 years old. And I remember it vividly. I already loved books by that age, so Belle was instantly my hero. . . Anyways, back to the music: Tale as Old as Time is a lovely piece, with a simple, timeless melody that is full of nostalgia for so many in my generation. And with the new live action movie coming out last year, it has seen a definite resurgence in popularity with kids again. Almost as soon as I arrived in McPherson, Tiffiney Harms, area piano teacher, invited me to join MAPTL (McPherson Area Piano Teachers League) and to participate in running their upcoming brand-new Espressivo Piano Camp. I eagerly accepted both invitations. 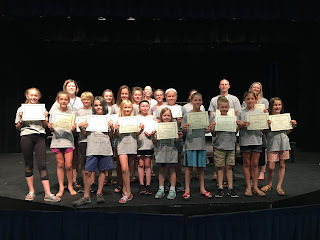 I have wanted to do a piano camp for several years now, but being a traveling teacher in Southern California made finding a place to host a camp a bit tricky. My associate teacher Mallory & I brainstormed possibilities a few times, but weren't able to come up with any options where we'd be able to reserve a location AND keep the cost affordable for parents. I know, I know it seems like the summer has just started. But the 2018/2019 school year kicks up in August, and that means the piano studio's session starts then too! 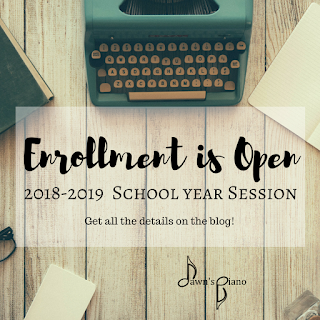 As of July 1st, enrollment for students who would like to begin in the fall is officially open. You can view the studio tuition & policy sheet for the 2018/2019 school year here. If you would like to set up a free trial lesson to try it out before the fall session starts, we can definitely do that. Just send me an email using the contact form.